Yesterday the Western Governors Association, a bipartisan organization representing the Governors of the 19 western states, announced a policy resolution recognizing the importance and economic benefits of efforts to cut methane pollution from oil and gas facilities – the nation’s largest industrial source of methane. There are environmental and economic benefits of reducing methane emissions and opportunities for the beneficial use of this natural resource. Many western states – in cooperation with industry in those states – have already implemented regulatory strategies that reduce methane emissions from oil and gas operations, while expanding the use and sale of methane. Methane is a potent greenhouse gas that oil and gas facilities emit along with other chemicals that deteriorate air quality and threaten public health. It is also the main ingredient of natural gas, so capturing more methane means companies can sell more gas. Methane reduction targets, therefore, protect the environment and benefit the economy. It is a critical reason why decision makers in the both the public and private sector are prioritizing methane reductions. The resolution is far from perfect. It tries too hard to excuse western smog problems because of some issues with background ozone pollution and international transport. It also fails to recognize the many opportunities for cost-effective local pollution reductions and the importance of the national power plant standards that are under attack. Western states have long been at the forefront of the methane conversation. In 2014, Colorado, under Governor Hickenlooper, became the first state in the nation to require companies to control their emissions. In 2015 Wyoming, under Governor Mead, also made strides to strengthen oil and gas rules to improve their state’s air quality. Since then, more and more companies and governments have followed suit. Most recently, California and Pennsylvania – both leading consumer and producers of natural gas – started requiring companies to reduce emissions, while other forward thinking companies like BP, Exxon and Shell, have also each recently agreed to set their own methane reduction targets. The states represented by the WGA produce about two-thirds of the nation’s oil and gas, but what’s noteworthy about this recognition is not only it’s bipartisan nature, but also the significance of its timing. Last week, a group of 24 scientists from 16 research organizations published a groundbreaking study in the journal Science that quantifies the total volume of methane leaking from the oil and gas industry. The study determined U.S. oil and gas companies emitted over 13 million tons of methane into the atmosphere in 2015 alone. That’s 60% more methane than government estimates suggest, and represents $2 billion worth of gas that could’ve served the needs of more than 10 million homes. The study confirms our nation’s energy infrastructure has a massive leakage problem, yet EPA Administrator Scott Pruitt and DOI Secretary Ryan Zinke are both attempting to rollback our nation’s existing methane standards. By highlighting the importance of methane reduction policies – the WGA resolution should be a clear signal that the administration is severely out of step with what the vast majority of westerners believe is best for their communities and their economies. It’s extremely promising to see this bi-partisan group of leaders recognize the value in reducing methane. But what happens next will be equally as crucial. Some western states have already made impressive strides to reduce oil and gas emissions, all without disrupting the local energy economy. Texas produces more oil and gas (and thus more methane pollution) than any other state in the county, but – neither Governor Abbott, nor the state’s regulators have proposed specific policies that could reduce methane pollution. This is deeply troubling for Texans living near wells or in areas with high ozone levels, a problem oil and gas pollution makes worse. And it does not bode well for the massive influx of oil and gas production currently expanding in the Permian Basin. Likewise, New Mexico’s term-limited current Governor Susana Martinez has been hostile in the methane conversation, even though the state wastes more methane from its federal and tribal lands than any other — $100 million worth per year. It is also home to the largest methane concentration in the country, a 2,000 mile “hot spot” that researchers largely attribute to oil and gas production. 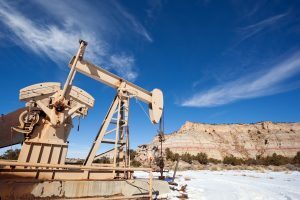 Utah’s largest oil and gas producing basin has also been struggling with air quality issues, spurred by oil and gas pollution, indicating the need for state, tribal and federal regulators to do more to restore health air. Fortunately, this methane resolution shows that the leaders in these states now have a bipartisan jumping off point to implement new policies that can protect public health, conserve energy resources, and expand their economies. It is now up to these state leaders to seize this moment and enact policies to reduce methane pollution and protect healthy air. This entry was posted in California, Colorado, General, Methane, Natural Gas, New Mexico, State, Texas, Wyoming. Bookmark the permalink. Both comments and trackbacks are currently closed.